The Music Center salute included James Taylor, Seal, Diana Krall, Brandi Carlile, Los Lobos and Rufus Wainwright. 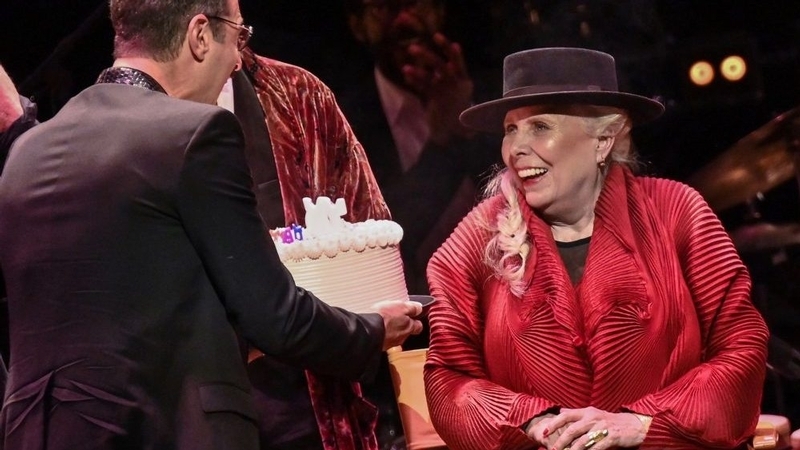 Joni Mitchell did not sing during a rare public appearance Wednesday night, but she did show off one of the most instantly recognizable grins in pop music history, which was emotional climax enough for the curtain call of "JONI 75: A Birthday Celebration Live at the Dorothy Chandler Pavilion." The tribute took place over two long-sold-out evenings at the Music Center, but only on the second night, the actual occasion of her 75th, did the birthday girl come by to blow out candles, and to be serenaded by a estimable slew of performing party guests who proved that none of Mitchell's previous breaths had been wasted, either. Tom Hanks stayed off-stage Wednesday, but spoke for many of the 3100 attendees and dozen key performers with his effusiveness on the red carpet. "To me Joni Mitchell was this wide, beautiful quilt that covered my growing up," he told Variety. "All of her songs were of a very particular sort of DNA. And because I was a guy, I should have been probably more impervious to what was there. But 'Blue" was it for me, and when you hear 'California' or 'Big Yellow Taxi' or all those other songs, it was the fiber of my youth," the actor continued. "It's Beethoven. It's the Beatles. It's Handel. It's classics that'll last forever and ever and ever. It'll never go away. It'll never not be moving and timely." In a video tribute that included absent friends like Elton John, Peter Gabriel noted the unusually challenging nature of her songs and equipped, "I pity the poor bastards that have got to sing them in front of you tonight." The audience laughed, some maybe remembering that Mitchell has not always suffered lightweights lightly. (Or heavyweights, either - she's hard on Bob Dylan!) But Mitchell, although she's still recuperating from a stroke, may have quietly had a say in at least a little of these proceedings. James Taylor told Variety on the red carpet that "I think Joni may have had a hand in selecting who was gonna play these songs tonight"; Seal likewise revealed before the show that he'd personally been asked by Mitchell to sing "Both Sides Now." But even if the guest of honor left every call up to musical co-directors Brian Blade and Jon Cowherd, it was a brilliantly curated program that had to have lived up to any attendee's exacting standards... even hers. On the red carpet, Carlile said, "Last night was terrifying. Tonight, I'm ready." Reminded that things might feel different with Mitchell actually attending Wednesday's show, Carlile amended her statement: "Okay, last night was terrifying, and tonight is terrifying. But I'm ready." She had one performer in particular she was surprised to be so taken aback by: "Seal really was stunning last night. I almost couldn't believe the command and elegance that just radiates off that guy." Diana Krall spoke before the show about the twin challenges of getting Mitchell's words and music right: "As a pianist, she's been one of the biggest influences on me," Krall said. "Because a lot of people talk about her guitar playing or her open tuning and all those lyrics, but not a lot of people talk about her piano playing. The musicianship is so complex, all based in jazz harmonies. You're concentrating on those (piano) harmonies but then there's the reading of the story on top of that and what you get from the verses and your voice. It's like interpreting a short play." Krall didn't make it easy on herself, picking a couple of what Mitchell might have called her "art songs," "For the Roses" and "Amelia." Carlile and Krall were the two singers who sounded most uncannily like Mitchell in certain moments on stage Wednesday. Carlile had the bravura vocal performance of the night, effortlessly hitting the high notes of "Down to You" in a casually octave-spanning fashion few others on the bill would have been down with attempting. But without making those leaps, Krall sounded like even more of a dead ringer for Mitchell - albeit the later, huskier-sounding Mitchell - in some of the phrasing of "Amelia." It may be a greater gift for mimicry than we knew Krall had... or maybe it's just a shared Canadian accent. 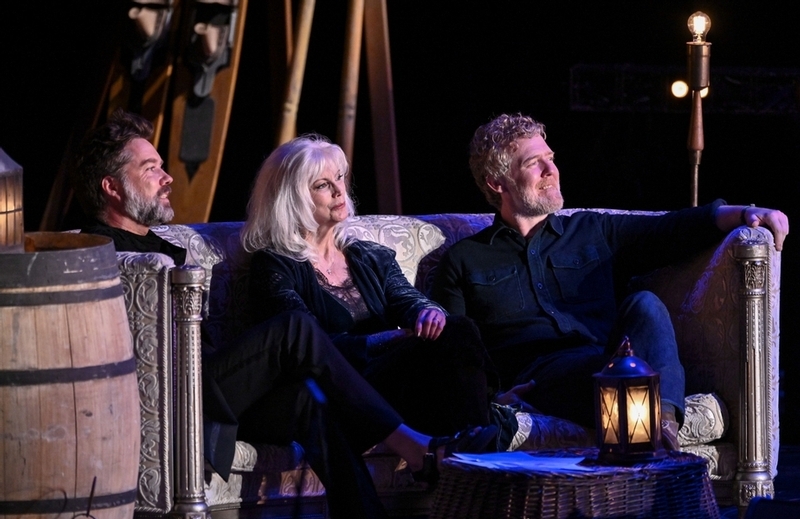 Emmylou Harris, whose style is not so infused with jazz, laughed and admitted before the show that doing a song like "Cold Blue Steel" is "totally out of my wheelhouse. But I'm going to give it my best shot, because I'm just grateful for the opportunity to say thank you to this extraordinary artist who's stuck to her guns, done exactly what she wanted, and expanded the musical landscape." Seguing between her two successive songs on stage, Harris also alluded to the challenges inherent in some of the subject matter: "That song ("Cold Blue Steel"), of course, is about heroin addiction, as far back as 1972," she told the audience. "I'm gonna lighten the load now with a song about women that were enslaved at convents back in Ireland ("The Magdalene Laundries")." Other highlights include Seal, as promised by Carlile - not so much for his Act 1-closing rendition of "Both Sides Now," which earned the night's first spontaneous standing ovation, but more for his return in the second half with the more challenging "A Strange Boy," the strangeness of which he knocked out of the park. Meanwhile, the most conceptually interesting choice of the night was having Los Lobos and La Marisoul transform "Dreamland" into something distinctly Mexican-American, signaled by a change of opening line from "It's a long, long way from Canada" to "It's a long, long way to East L.A." This espanol-enhanced version adhered to Mitchell's snowier original only in one significant way: Chaka Khan, who sang on Mitchell's original '77 recording, came out to join the fun (after having already appeared for a solo run at "Help Me" and "Two Grey Rooms"). Rufus Wainwright, Norah Jones and Glen Hansard turned in knockout numbers that would have made them singular MVPs on just about any of the other 363 nights of the year. But besides the aforementioned highlights, there were also inescapably sentimental favorites from three of Mitchell's contemporaries. 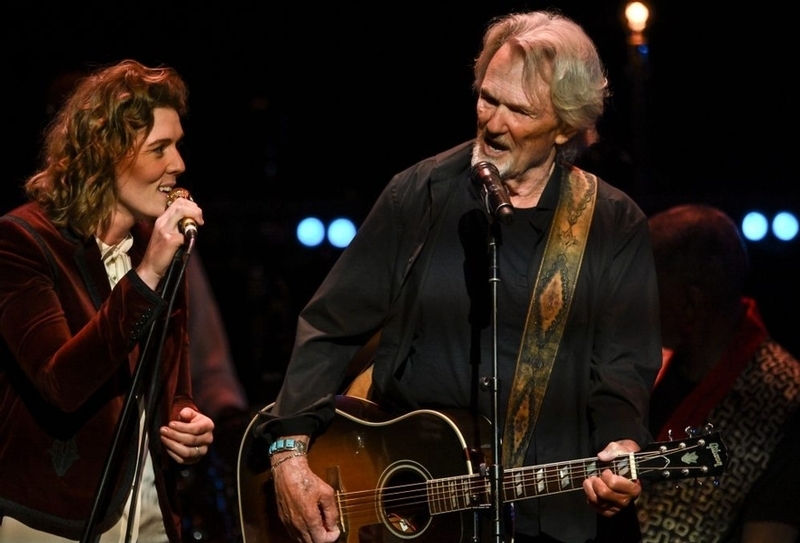 Kris Kristofferson is not going to win any mellifluousness championships these days, but he was half-responsible for the sweetest number of the night, as Carlile joined him for a duet of "A Case of You," a sort of vocal beauty-and-the-beast juxtaposition that paid off. Meanwhile, Graham Nash started the second half of the show by saying, "Every song you'll hear sung tonight was written by Joni - except this one." He then performed to lead a sing-along of the CSNY ballad he was inspired to write by their domestic tranquility in Laurel Canyon at the time, "Our House" - with a topical introduction: "Quite frankly, after the election yesterday, I'm so pleased to have our House back." Taylor goes that far back with Mitchell, too. "I played on two of the originals" of the songs being performed, he pointed out on the red carpet - "A Case of You" and "All I Really Want." "Joni played dulcimer and I played guitar," he said. "It was 1971, maybe, the album was 'Blue,' the producer was Henry Lewy, and the studio was A&M at the corner of La Brea and Sunset. It was a great session." But rather than those, he was performing "Woodstock" and "River" (which he'd recorded for a Christmas album last decade). "They're just favorites of mine, and I claimed them early in the scramble to get the material everyone wanted," he explained. Taylor was happier that others were doing more obscure selections, though. "Rufus Wainwright has clearly studied on her, and I know that Brandi Carlile is a Joni Mitchell-phile and a deep, deep listener - and the two of them and others are doing not just what people would think of as the accessible tunes, but some out-there selections that are being performed tonight that really represent the way Joni stretched the genre. I mean, she's totally sui generis. She invented her own self and her own style, and man, it's amazing to see an evening out of it." Asked how Mitchell is doing, Taylor said, "I think she's better and better. And I think her involvement in this project tonight has been a good thing for her." Others walking the red carpet included Eric Idle, who noted that he'd named his now 45-year-old son Carey after the "Blue" song of that name. Asked if he'd been invited to sing a little bit of Mitchell for the crowd, the comic actor said, "Thank Christ, no! I couldn't sing a Joni Mitchell song. I've played the guitar 45 years and I still haven't mastered one." George Takei was not so reticent - he serenaded Variety, in full voice, with the wordless version of "Both Sides Now" that he claims he sings in the shower every morning. Rita Wilson has recorded "River," but on top of that she reminded us she also wrote and recorded an original song called "Joni." "I was like, there's a song about Bruce Springsteen and a song about Tim McGraw, so why isn't there a song for Joni Mitchell? So I wrote it." After the concert, guests made their way to the Grand Hall, where the Dorothy Chandler Pavilion was transformed into a rustic bohemian dinner setting that evoked both Joni Mitchell's native Canada and her Laurel Canyon period. A massive video screen showed the view of the water from her British Columbia home, while antique chairs surrounded long tables laden with lanterns, moss and woven-twig placemats. Guests mingling at the exclusive dinner included Rosanna Arquette, Lily Tomlin, Anjelica Huston, Darryl Hannah, Jake Gyllenhaal, David Geffen, LeVar Burton, Angela Bassett, Jon Hamm, Marisa Tomei, St. Vincent and writer-director Cameron Crowe, who presented Mitchell with the Music Center's excellence in performing arts award. Crowe paid tribute to Mitchell, who received a constant stream of well-wishers at the center table, saying "To know her is to drive home at night feeling giddy with inspiration... She remains our best field reporter in matters of the heart, or in the world... or if you're just looking for an excuse to kick up your heels and feel more alive. She is heavenly inspiration at a time when heaven is in short supply," said Crowe. Nearly all the musicians who had performed onstage celebrated at the birthday dinner. Crowe approached Carlile to rave over her soaring version of "Down to You" and touching duet of "A Case of You" with Kristofferson. Crowe pointed at Kristofferson, telling Carlile that the singer was his first interview at the age of 15 years old when he met him backstage in San Diego. Guests found placards at their tables asking them not to ask Mitchell for autographs, but the evening's performers weren't shy about stopping by her table for photos as a seemingly cheerful Mitchell stuck around after dessert. The birthday dinner raised more than $1.1 million for the Music Center's artistic programming for underserved communities. The concert will be shown on PBS's Great Performances in 2019, and a live concert recording will also be released. This article has been viewed 725 times since being added on November 9, 2018.